Wondering about the Chile Flag? Guess which is the Chile Flag? 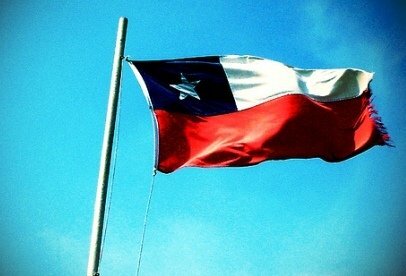 The Chile flag has only three colours… Red, white and blue and it is very much alike the Texas flag. I’m sure that people do get confused. See? So which is the Chile flag, top or bottom? If you guessed bottom then you’re right! Well anyway as you can see the bottom half of the flag is a red strip and the top half is divided into blue and white. On the top left corner there is a blue square and in it, right in the middle, is placed a white star. This is Chile’s national flag and it was made official on the 18th of October of 1817, by Bernardo O´Higgins and Jose Ignacio Zenteno. There is a difference of opinions on who designed it, some say it was designed by a Spanish military called Antonio Arcos. Others say that Gregorio de Andia yVarela was the person who designed it. It was first presented in the Chilean declaration of Independence ceremony on February 12 1818, and it was Tomas Guido who presented it. This was what the first version of the official flag looked like. As you can see the coat of arms of Chile of the time was in the center of the flag and the star point isn’t pointing upward like the current flag, its point is pointing toward the top left corner. This star was used to represent the native indigenes culture of Mapuches, they used called this star ¨estrella de Arauco¨. Even though this star is supposed to have 8 tips y was finally decided to use only 5 tips and the eight tip star on the inside, which you can see if you look closely. This design of the Chile flag was changed because of its difficultly to make, so they decided to take out the coat of arms and the eight point star. In 1854 was when they decided on the proportion of the colours and in 1912 they decided on the size of the star. They also decided that these would be the colours of the presidential band starting from left to right and top to bottom, blue, white and red. Different from other countries, there is a law in Chile that states that all habitants of Chile must have respect for Chile’s national emblems and are only allowed to raise their flag on national holidays such as May 21st and Chile’s Independence days (17, 18 and 19 of September). If people do not raise them during this time they might get a fine, and if people raise their flags any other times, besides the days I just mentioned, they also risk getting a fine. But to tell you the truth I haven’t ever heard of anyone getting a fine in all the time I’ve been in Chile.This year of 2010 was Chile’s Bicentennial year. During the flag raising ceremony that is held in front of the government palace, the current president at the time Sebastian Piñera, announced that any Chilean may raise the Chile flag any other day besides the national holidays. He stated would be a symbol that Chile is actively participating in democracy but in order for this to be official there must be law that reinstates this and there still isn’t any. The presidents of Chile have a special emblem on their flag and are exclusive to the president. This Chile Flag has the current coat of arms in the center of the flag, much like the old flag had. This flag my only be raised or used in spaces where the president is and is restricted to official ceremonies that the current president attends. It must always be placed on the right side of the podium. It is also used on the cars that transport the current president. When the presidential flag is raised the national flag cannot be raised at the same time and place. No civil person is allowed to raise this flag as it is illegal.